Spring is the best time to visit the local zoo or wild animal park. For one thing, the zoos do not have their summer crowds. Then they also have this years crop of new babies to show off, whether it's a shy baby chimpanzee, or a awkward baby giraffe. The hippopotamus, nicknamed Owen and weighing about 300 kilograms, was swept down Sabaki River into the Indian Ocean, then forced back to shore when tsumani waves struck the Kenyan coast on Dec 26, before wildlife rangers rescued him. "It is incredible. 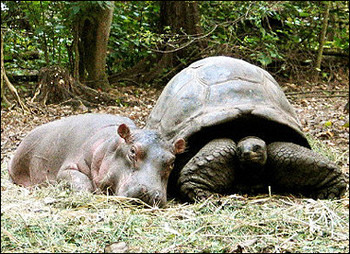 A-less-than-a-year-old hippo has adopted a male tortoise, about a century old, and the tortoise seems to be very happy with being a 'mother'," ecologist Paula Kahumbu said. "After it was swept and lost its mother, the hippo was traumatised. It had to look for something to be a surrogate mother. Fortunately, it landed on the tortoise and established a strong bond. They swim, eat and sleep together," the ecologist added. "The hippo is a young baby, he was left at a very tender age and by nature, hippos are social animals that like to stay with their mothers for four years," he explained. In 2002, a barren Kenyan lioness made several attempts to play mother to baby antelopes, one of which ended with a rival lion making a meal out of the calf. is grown so weary that it holds nor more. in which stupefied a great will stands. one early spring, my daughter and i went to the zoo in her college town. i was ecstatic over the early sping flowers. she laughed at me that i was more interested in the plants than the animals. Written in the third lunar month of 1686 貞亨3年閏3月. His friendly neighbour, the priest Sooha 宗波 Soha of the Obaku Zen school, had gone off for a religious trip to Kyoto. This is the good-by present for him.